To John, Art was another customer of his. To us, he’d been a source of inspiration for decades. After getting over myself, it finally sunk in. 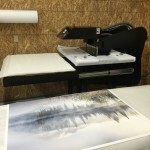 Two weeks before the conference, and I had to perfect our dye sublimation printing process for making metal prints. And damn quick. 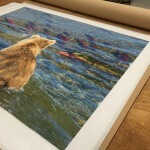 Up until only a few days prior to this big request, we were still on edge a little, having had some troubles with large metal prints – those over 16×20 or so. 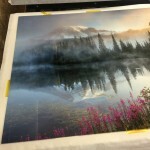 Of course, John wanted us to press Art Wolfe‘s images at the largest our press could go, which is 30×40. And I also had a presentation to put together, for the same crowd that Mr. Wolfe would be presenting to at the conference. Not a lot of time. But we had to get it right. 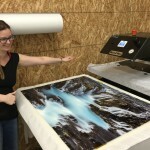 John talked to the folks at Chromaluxe and asked them to send us out a handful of 30×40 metal panels to print Art’s images on to. 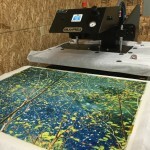 He sent his son and business partner Ryan out to have us run some small test prints to run by Art’s studio manager, and get in front of Art himself to get his go-ahead for the project. The plan was to press his images on to 30×40 metal plates. So we ran some tests on 8×10 plates, so we weren’t blowing through expensive panels only to find out the color was a little off. A few days went by…and we got the call. It was a go. We were a little nervous. We had to get the edges fixed. 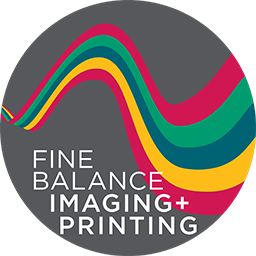 We had to knock out six perfect prints. We also didn’t have the plates yet. Chromaluxe had a little hiccup in their shipping department. We waited. The conference was in a little over a week. 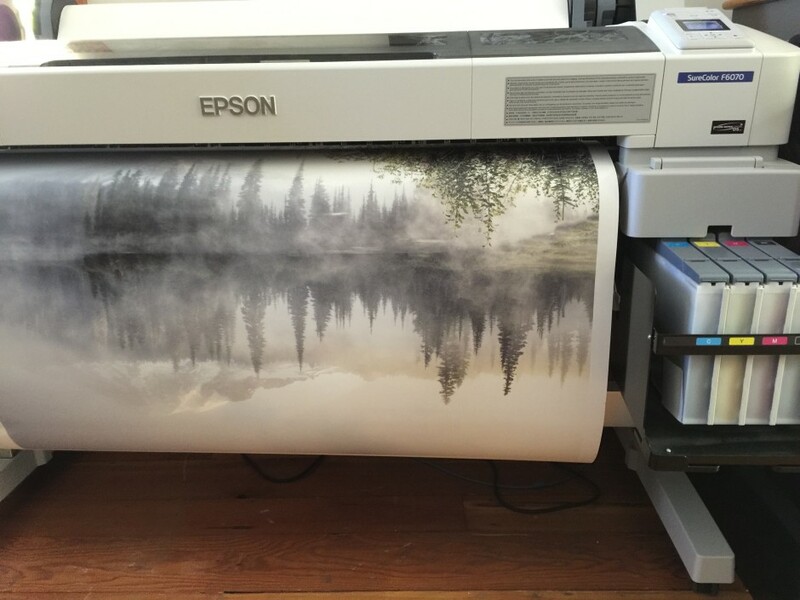 We had all the prints off the printer…but only on paper. The 30×40 plates were somewhere on the other side of the country. Now here’s the thing about metal plates: they’re heavy, and they have to be shipped freight most of the time…not UPS or FedEx…but on a palette. Apparently, the freight went to someone else. Not us. Three days before we had to have them printed. I ran a test on a 20×30. The edges. Oh god, the edges. The 30×40 plates arrived. 2nd Day to us. That’s not a cheap endeavor, sending a palette of 30×40 metal plates across the country in 2 days. It’s not 2nd Day Air. It was on a truck. I still was getting between 1/16″ and 1/8″ missing ink along the edges of the bigger metal prints. It really sucked that this was the case. Because I had six 30×40’s to do in a couple days, and they had to be right the first time. I had too few plates to make mistakes, and too little time to reprint or to get more plates shipped to us. Because of a shipping mishap, we were a week behind schedule. Chromaluxe went the extra mile and sent out some Endura. Overnight. It was a life-saver. Basically just some polyester fabric with the right kind of weight and weave to it that it dispersed the steam from big plates and all the sandwiched layers of paper, removing the issue that caused the edges to be inkless. We pressed the first one. It looked pretty damn good. The next five went pretty well. Until I looked up close. Crap. Specks. WTF and all that?! So moisture isn’t the only problem. 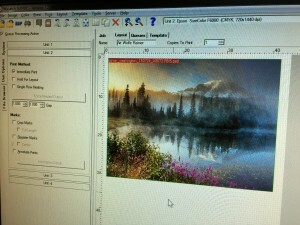 Sometimes, depending on the colors in a print, if there’s just a little too much density of one color…it migrates. Not often. And usually not noticeable. But the blacks from the deep shadows in a shot of an Icelandic waterfall had migrated into the otherwise flawless smooth cascades of icy streams. The ink, while in its gaseous state, is supposed to go straight from the paper into the polyester coating on the aluminum. But sometimes, with really big panels, there are issues. The big panels have to be in the press for a couple minutes longer than the smaller panels. It takes longer for a big metal plate to heat up evenly. In that time, the ink, now as a gas, can move around a little more than you want it to. Most of the time it’s not a problem, but every once in a while…………. So we had to throw a plate. A big 30×40 plate of one of the world’s top photographers. Next plate – the reprint – was perfect. Thank goodness. 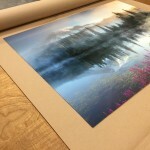 Now we just had to get all of these beautiful images to Bellevue without any bent corners or scratches and get them hung up on the twenty-foot wide display panels they’d shipped in just to hang Art’s images. Luckily, that went off without a hitch. As you can see…in Part Three!